I managed a Storage Facility for several years in VA so I knew what to look for before choosing a new Facility in MD to store my belongings. This facility is clean and secure with no leaking and/or flooding issues during heavy downpours. Raising the rent EVERY YEAR is my only complaint. Great facility and great management team! I have been using them for over 4 years and I recommend them! Excellent customer service and very clean secured storage facility. It suited my needs, not shore about others. This location was close to me and met all my expectations. All my needs were met. Not having a contract made it even better. Thanks for being there when I needed storage. O C mini storage is a great place, paved roads, very clean, price is good, everything is in working condition, I'm very comfortable with the security, the property is very well maintain!! I'm actually going to miss this storage facility. Always clean, always friendly, always helpful. The customer service is unbeatable. I had my unit for close to a decade and my rates went up only a few bucks over that time. It's secure, the climate control never failed, they have carts to use, restrooms on site, and packing needs for sale. There is tons of room for bringing in moving trucks, and a great layout so you won't have to try to back that 20' Uhaul around any blind corners! I've had half a dozen storage units over the years, and OC Mini Storage has been by far the best! If you need storage in the area, this is the place to go! I had a great 7 year relationship with the management of OC Mini Storage. Fair pricing, convenience, clean, and professional management. I'd do it again. I appreciate this location after having my belongings in another storage area. Very clean and easy access. Will be back here when I need storage again!! We have used Ocean City Mini Storage 2 times thus far and would definitely use it again. It is well positioned right out side os downtown OC, which made it easy to get our things that we had stored. The units were clean and various sizes. It was easy to reserve and the staff were great. Thanks to Lee for helping get us transferred to a different storage unit even though we couldn't be in town for the transfer. Allowed us to save time and money while we dealt with a family emergency. Excellent customer service and a willingness to go the extra mile! Much needed clean, dry, safe storage space for YEARS! Coupled with customer service that went above and beyond no matter the transaction. An absolute pleasure to work with. well maintained and friendly staff. Couldn't be more pleased. Lee was great helping us get a unit. Lee is great. Locker was clean & well maintained. Would use them again!! Would definately recommend this facility! Very well maintained and clean. Received friendly and helpful service - would absolutely use again. We couldn't be more pleased with our experience. ! Well maintained, clean, secure storage. Would absolutely use again! We have been very pleased with our association with these folks. Outstanding service and facilities! Highly recommended! Extremely helpful and friendly service. I've used several different storage facilities in multiple states and OC Mini Storage is by far the best of them all. The units are immaculate. I absolutely recommend this facility! Great facility, they really care about each unit! Every unit matters...Lee is awesome! Love the month to month, no contract concept. Units are well lighted with easy access. Cleanliness is important and this facility is spotless. Good people to work with---refreshing common sense is always in play. OC Mini Storage was recommended to me. I now recommend it to any/everyone. The price is competitive, the facilities are clean and extremely well kept, the staff, Lee, is professional, efficient, effective, but more important, kind, and considerate. Been renting a unit here for year. They had to renovate the building i was renting so we had to get a unit elsewhere for 2 seasons and hated every minute at the new place. As soon as a unit opened up we came back as soon as we could. The owners even remembered us and thats rare these days. They are friendly and professional. The units are clean and pricing competitive. Its great to have a storage unit so close to our condo. Very clean place inside & outside ! The place is very clean , 2 hand carts provided in every climate controlled buildings and cameras inside and outside of each building . They also have completely gated security fence around the property . Would highly recommend as the finest self storage we checked out in Berlin and Ocean City areas ! My husband and I needed a unit close to our home and staff notified us right away about an opening. My daughter moved and also needed a unit in our neighborhood. The staff contacted us when a unit was going to open and was wonderful about getting it ready quickly for us. We recommend Berlin mini storage to everyone. Thank you very much!!!! Customer Service Can't be Beat! The owner could not be more accommodating. We had a very difficult move and arrived late in the evening. He worked with the movers to get us in a unit. Our current unit is not exactly what we want but he is working to get us placed in a more convenient location. I would recommend him to anyone needing a storage unit. Lee is a great guy and offers space at an affordable rate. Easy to access the facility and you can pay online which is ultra convenient for my busy schedule! I highly recommend. Lee is a great guy, I have been using this facility for several years and Lee has been very accommodating and helpful, the units are always clean and work well. I love using this facility, its well secured and I love the convenience of being able to get in and out when I need. Excellent! Both the staff and the facility. Lee & Dawn do a great job taking care of the facility and the customers! The facility is expanding and upgrading the parking lot. The best place in the area!! I come back every year. 5 Star Service! This place is great! The grounds are kept clean and spotless. People are friendly and helpful. Our lock rusted shut and they helped us by cutting it off. We thought we were going to have to go and buy a bolt cutter from a hardware store. This place is amazing! The staff is very friendly and very helpful. The grounds are clean and well run! I give this place 5 stars!!!! I highly recommend this place! I do not normally write reviews, but this place deserves the recognition. They are All Around Excellent and above all are friendly, helpful and fair. Highly recommended! Great customer service, Lee always delivers what he promised. Been renting space there for about 6 years. Lee is doing a great job and his wife should give him a raise. Highly recommend if you need storage. As for boat/trailer storage, cheapest around. I've been using OCMS for many years both with Lee and Dawn (the current management) and prior with Lee's Dad, Rick. Both generations have been extremely helpful and accommodated our storage needs. Couldn't bee happier and would highly recommend them. I have been delighted with the service and quality of this storage facility. this is the first time I have ever needed to rent a storage facility--oc ministorage is excellence plus. I never used one before .Seems very well run and clean. Great facility. Lee runs a tight ship and is always available. This is run better than any sites I have previously used. Not to mention, all the wonderful renovations. Keep up the good work!!! I've been using OC Mini Storage for about a year now and am highly satisfied with their fees, location, and customer service. lee the gentlemen running the facility could not have been more helpful. 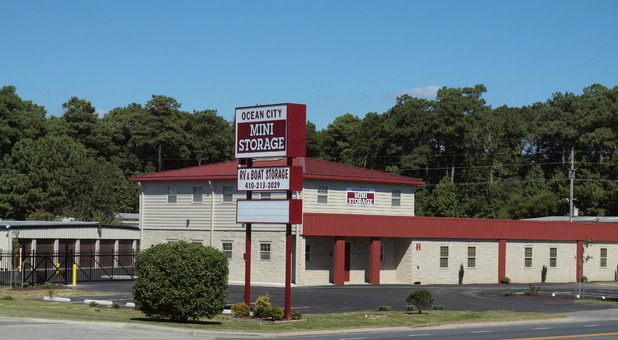 The storage facility is easily accessible, and conveniently located in the ocean city area. I've been a customer a number of years and am always pleased with the storage unit, its location (close to Ocean City) and customer service. Excellent facility and the onsite manager (Lee) takes good care of his customers. Convenient, affordable easy access during the day !!! I have been dealing with Lee for just about 6 months and he has been great. I'm sure I will continue his storage service indefinitely. Living in Ocean City makes it very convenient for my storage needs and his fees are very competitive in the area. Thanks Lee for being so accomidating and professional. I've utilized this storage company several times and they are always very nice. Great Service, clean, and easy access to units. This place is great! The manager, Lee, was overly accommodating when our out-of-town move ran late. He stayed in the office to give us access to the unit and make sure we had everything we needed. I would definitely use them again and it was very clean and secure. Can highly recommend the facility and the customer service. we've been using the facility - indoor with heat/ac - for over a year and have been very happy with it. clean, well run, competitively priced.